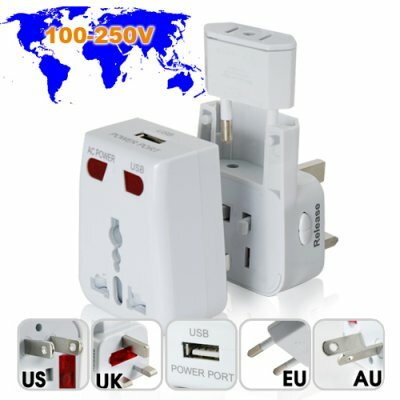 Successfully Added World Travel Adapter with USB Charging Port to your Shopping Cart. World Travel Adapter with USB charger for use at any time and at any place. This adapter's 3-in-one design fits all the most common outlet styles in the world and is great for use both at home and abroad. Notes: Who wouldn't get this? This travel adapter is small enough to keep in your bag or at home for those "what-if" situation. If you're looking for that one device to make your life and travels easier, then this world travel adapter with USB charger definitely won't disappoint. With a minimum order quantity of 5, you can keep one at the office, at home, in your briefcase, in your bag, or even give some to your friends. Our low factory direct price also makes this an ideal item to buy in bulk for lower prices and then sell individually to your customers. Brought to you by the leader in factory direct China electronics - Chinavasion. Its not the most compact, but it fits all countries I been to so far. and the USB power is a very nice addition. The USB power failed once when I use my 2A charger with an empty device, but I only noticed that once. It replace all my adapters now.